The Crocker Art Museum, long-time contributor to the Campus Community Book Project, presents Art Rx, a bimonthly event for chronic pain patients and caregivers. Art Rx serves those with chronic pain and caregivers for patients or loved ones facing the end of life. 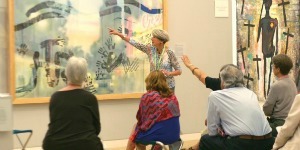 These individuals along with their guests are invited to enjoy facilitated group conversations about select pieces of art with a trained docent. The goal of Art Rx is to encourage positive experiences that reduce the burden of chronic pain and caregiver stress.